Nepenthes ventricosa X spectabilis is a Borneo Exotics hybrid between an intermediate / highlander and a spectacular clone of their N. spectabilis highlander. This hybrid was also done in reverse (N. spectabilis X ventricosa) and looks somewhat similar. Both EP and BE readily use N. ventricosa as a parent plant to hybridize with and that's one reason there's so many crosses with N. ventricosa in them. I like that this hybrid was available from seed which isn't always the case with BE plants. Most are from tc, or tissue culture, and that limits the variability from plant to plant. 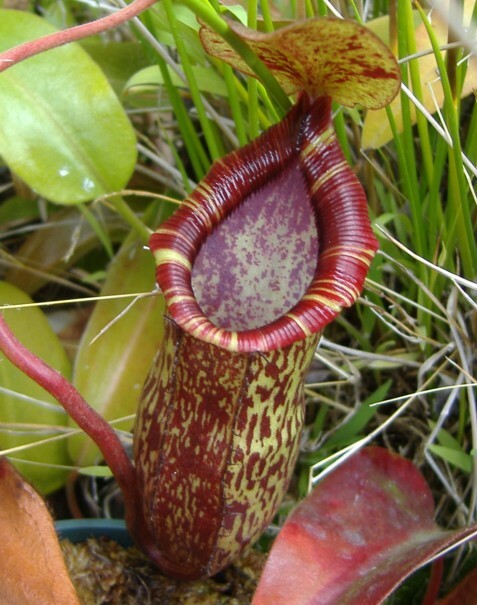 It's a nice hybrid and the pitcher above really stood out because of the striking maroon in the peristome. How much of that red will materialize as the plant gets to adulthood remains to be seen, but this clone seems to be standing out as a good example of this cross.